Exide is one of the renown names in inverter battery and UPS segment. It is actually more than 100-year-old company, which had quite a few revisions in naming and businesses. Started just as an importer, Exide now has 7 manufacturing plants in India with other in Sri Lanka and Singapore. Exide is the largest manufacturer of the battery in the subcontinent offering the widest range of storage batteries from 2.5Ah to 20,200Ah capacity for the broadest spectrum of application. This application includes: inverter batteries, vehicle batteries, industrial batteries, submarine batteries and solar batteries. In fact, it is the only brand which supplies batteries to the Indian Navy. Though batteries are the main forte of Exide, the company has also ventured into UPS segment with the establishment of Home UPS plant in Roorkee a few years back. In this article, we will go into the details of prominent inverter and inverter battery technology that the latest Exide products come with. With a smart display, it is easy to manage and preplan power backup requirements for power cuts. But it is important to note that this estimation depends on the load on inverter and battery charge status. So, it is not 100% accurate. Inverters, which converts direct current (DC) to alternating current (AC), are designed to be used with different voltage ranges and topologies. Besides the main functionality of DC to AC conversion, modern Exide inverters also provide additional functions like power maximization, battery charging, and protection of the circuitry. All these functions require specialized control that can occur in real time or near-real time. The wide variations in application mandate the need for a system control to be highly flexible. Digital signal processor (DSP) inverters/UPS from the GQP series comes with that high level of computational performance needed for the real-time signal processing in the inverters. DSP helps the inverters with motor control, power conversion and sensor processing. Normally, when regular power is available, an ordinary inverter helps the load (household appliances connected to the power outlet) work by passing on the main supply while simultaneously charging the battery. Now, if there is an issue in the inverter, then an ordinary inverter will not able to bypass the mains and would start drawing power from the battery. This would result in momentary discontinuity of the power and would only work till the battery lasts. This means customers need to call an electrician/engineer to fix this issue. But thankfully new inverters in the latest GQP series comes with a mains bypass feature. So, even if there is an internal problem in the Exide inverter or it stops working, then the mains bypass feature comes to the rescue. It bypasses mains and works the load without turning on to the battery for supply of power. This eases the customer’s predicament of frequently calling the inverter service guys and eliminates the need to change the wiring. There are 3 types of batteries and tubular batteries are the most efficient of all three. In tubular batteries, the positive plate is replaced with a tube and protected by a cloth. That’s why they are called a tubular battery. Tubular batteries come with the longest battery life and they are expensive. But some companies have started offering tubular batteries at cheap prices than the trusted manufacturers. These ‘cheap’ tubular batteries may result in battery failure in a very short period. That is because they employ second rate casting processes like gravity type casting or low-pressure casting. Though all tubular batteries may be similar in the startup, not all tubular batteries are the same. The difference is in the composition of the alloy and the way that the main backbone of the plates (called spine) is cast. Exide tubular inverter batteries employ something called Torr Tubular technology wherein high-pressure Hadi casting process is employed. The spines in Exide tubular batteries are cast from low antimony lead alloy, with copper, selenium and tin. This protects the battery from anodic corrosion. Machines using Hadi casting technique are highly efficient but are expensive–costing few crores as opposed to few thousands for the machines using gravity or low-pressure casting. Exide tubular battery like Invatubular uses a smart technology that seals the active material in polyester tubes called gauntlets, instead of transferring it on the plate’s surface. Thus, there’s no shedding or corrosion, ensuring longer battery life. Exide tubular batteries are tough and durable enough to operate even in extreme temperatures and can bear the vagaries of frequent and prolonged power outages. 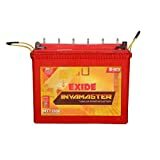 Exide is a known battery brand which has recently forayed into UPS segment after a huge demand from consumers who wanted optimal performance out of their robust Exide batteries. Exide manufactures only pure sine wave inverter models in contrast to competitors coming with both square wave and pure sine wave models. First-time customers with zilch knowledge about inverters are often cajoled by the inverter dealers with noisy and risky square wave inverters. Noisy because it produces humming sound in running the ceiling fans and is risky because it is not appropriate for a sensitive electronic device like computers or smartphones. Another plus point with Exide inverters is they come useful display with LED indicators which apprises the user of almost everything needed from the amount of load connected to the status of battery charging. Moreover, its only of the few brands which come with an electrolyte level sensor. When the electrolyte level goes down, the LED in the front panel of the inverter blinks. Another advantage with Exide inverters is low harmonic distortion which is less than 3%. There are a few shortcomings with Exide inverters as well. Since they have a dedicated cooling fan, Exide inverter are generally noisy. Moreover, the low voltage operating a range of Exide is just 120V whereas Luminous models can work with voltages as low as 95V and Su-Kam models like Falcon+ can work even in 90V. Price of Exide UPS/inverter used to be high when they initially started offering UPS models, but now the rates have abated and even available for prices lower than all other competitors. It is recommended to buy inverter online in case if local dealer prices are not reasonable. We have collated a list of excellent models with their links to easily buy from Flipkart and Amazon. Hope you will find this review useful and don’t forget to check the shortlisted models given below and buy the right one according to your need. In conclusion, we can say Exide is definitely one of the best brands for inverter batteries and is surely reflecting the goodness of batteries in its inverters too. But as it is relatively a new brand only time will tell if it happens to surpass the big 3 of the UPS industry–Su-Kam, Luminous, and Microtek in the future.